There is significant evidence instructional coaching coupled with that high-quality observations and meaningful feedback are among the most effective ways to promote teacher growth. 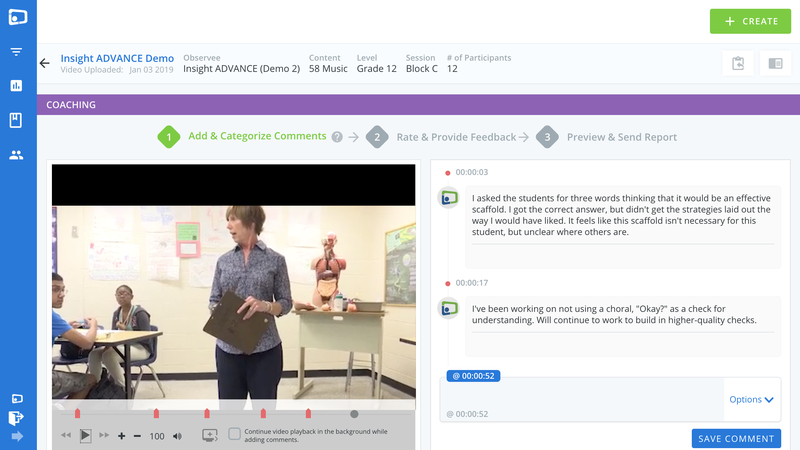 With ADVANCEfeedback®, instructional coaches and teachers can connect on a deeper level using video as a common piece of evidence. For video-based observations, teachers capture video and audio from any device, in any video format. For video-based observations, coaches embed feedback in key moments in the lesson. For live observations, coaches capture their notes in "Live Action Notes." Engage in a coaching conversation to process the feedback together and make a plan for improvement. Receive notifications when videos have been assigned. Access videos from anywhere, anytime. Reference the instructional framework, rubrics and teacher goals and comments while providing feedback. Capture notes and embed comments at specific moments in the lesson. Write and submit feedback reports. Review and debrief with teachers. Track teachers’ growth over time.